Together with the national parks, Kenya's animals have earned the country the reputation of the world’s safari capital. Few countries have a bigger variety in wildlife than Kenya. Wild animals present in Kenya range from lions, cheetahs and leopards, to elephants, buffalos, giraffes, zebras, impala and many more. Many of them live in the well-managed national parks and reserves. Most famous among them are the “Big Five” (see below). Here’s a list of all important animals of Kenya. However, Kenya is not only a classic “safari animal” paradise. It’s much less known that Kenya also offers some great opportunities for bird watching – over 1,000 bird species have been recorded and many tour operators offer special “bird watching safaris” - more on my page about Kenya’s birds. Moreover, the beautiful coral reefs at Kenya’s Indian Ocean coast are home to wonderful exotic fish, reason why professional divers count Kenya’s diving opportunities as being among the world’s best. Which Animal Is At Which Wildlife Park? If you’re visiting Kenya and are looking to see particular animals, do your research. Not all of Kenya's animals are present in all parks. 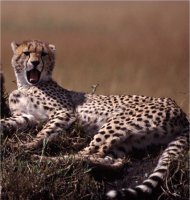 See my separate page which Kenya wildlife is present in which park. For the rest, you simply have to be at the right place at the right time to see Kenya's animals. One basic rule is that national parks with large open plains (among them Masai Mara, Amboseli and Tsavo East) offer the best opportunities for wildlife viewing, since animals tend to hide in the bush if there is any. For the same reason, wildlife viewing can be done best during the dry seasons (which coincide with the tourist seasons). Many animals sleep during the middle part of the day, so wildlife viewing is best done right after sunrise and before sunset. While many animals do great in Kenya, a number of animals is threatened. The black rhino is one of the most endangered animals in Kenya. In the whole world, there are no more than 4,000 left. Luckily, in Kenya the black rhino population seems to be on the increase again. Lions in Kenya are vulnerable too. Within Kenya they number no more than 2,000. Here’s more about endangered wildlife in Kenya. It’s important to respect the animals’ own sphere. For example, in most national parks it’s not allowed to drive outside the roads and tracks. If your safari driver does so, please ask him to stick to the roads. But do come to watch Kenya's animals. By going on safaris and visiting the national parks, you are supporting Kenyan animals since a considerable part of the entrance fees are used for wildlife and nature conservancy. The Kenyan government has been doing a lot more to protect threatened animals such as lions since tourism has become the country’s biggest foreign income. The “Big Five” are the 5 animals (lion, buffalo, rhino, leopard and elephant) anybody who's going on a safari hopes to spot. One other reason why these animals are classed together, is their original status as a "game animal" for hunting. This is why popular animals such as the giraffe or hippo are not part of the Big Five despite their widespread populations, and beautiful sight. Because many Kenyan animals are endangered or threatened, hunting is not as prevalent as it once was. Indeed, in the old days going on a safari meant going on a hunt. Luckily in most cases, the rifles have been replaced by photo cameras. LION - Prides of lions can be found in many parts of Kenya, particularly in the savannah and grassland regions in the southwest part of the country. Some of the best wildlife parks to find lions are the Masai Mara National Reserve, East and West Tsavo National Parks, the Samburu National Reserve, Laikipia and Amboseli National Park. Though there once were more than 10,000 lions living in Kenya, their numbers have dropped to around 2,000. Lions are threatened by several things, including poachers, poisoning by local farmers (who want to stop lions from attacking their cattle) and the traditional Masai coming-of-age tradition of boys spearing a lion in order to become a warrior. BUFFALO - African buffalo are large herd animals that live in various regions of Kenya from the grasslands, to the forests and floodplains. They are sometimes called Cape buffalo. They should not be confused with placid cows, as they are actually very dangerous to humans. Many people are gored by African buffalo each year. Along with the hippopotamus, they are considered one of the more dangerous animals in Kenya. Marsabit National Park and Mount Kenya National Park are good locations for sighting the African buffalo but they are also widespread throught southern and central Kenya. They are not considered to be particularly endangered. RHINO - Unlike the more abundant animals of Kenya, the Rhino is far scarcer. Poaching for their unique horns has severely reduced their population. Two species of rhinoceros are found in Kenya: the black rhino and the white rhino. The names are not based on their colour, and the two types of rhino look basically alike. There is a black rhino sanctuary at the Lake Nakuru National Park, providing a prime viewing spot. Rhino herds are also frequently seen at the Meru National Park, and occasionally at the Masai Mara Reserve. They can also be found at the OlPejeta Conservancy and Nairobi National Park. LEOPARD - Leopards are the smallest of the big cats, and looks very similar to the heavier jaguar. Leopards that are all black are often referred to as "black panthers". Like with most big cats, the leopard is hunted and poached for its pelt which has started to threaten the species. Their habit of dragging their kills up into trees can make for great photo opportunities. Leopards often take down animals larger than themselves, like antelope or wild boar. Leopards can be seen at many parks, particularly the Masai Mara, Samburu National Reserve, and Tsavo West National Park. ELEPHANT - The final member of the Big Five is the African elephant. The African elephant is bigger than the Asian elephant, and has large flapping ears. Like the rhino, it's unfortunately hunted for its tusks, so it is a protected species. 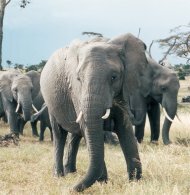 Eastern Africa is one of the few areas where the elephant is thriving, and numbers are growing. They are very plentiful in some parks, such as the Shimba Hills Reserve, Amboseli National Park, Samburu National Reserve and Tsavo East National Park. Elephants travel in herds, and can be quite destructive to the vegetation and landscape when their population gets too high. In Kenya, elephants are found living in either the savannah grasslands or in the forested areas.